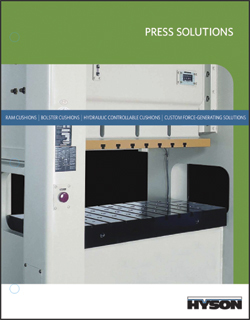 Hyson Products, Brecksville, OH, has published a new 12-page brochure cataloging its expertise in supplying ram cushions, bolster cushions, hydraulic controllable cushions and custom force-generating systems for metal stampers. Described are cushion options for new press builds as well as for press upgrades and retrofits—four-post, stud-mount, ram, spring-box and bolster cushions. The brochure also features case studies and an application sheet that reviews the information needed to start the process of system selection and design.